That source of pride is a bed 20 feet long by 3 feet wide that’s overbrimming with luscious greenery. I planted it back in April, 4 rows, one of radishes, one of mustard and arugula, and two of various varieties of leaf lettuce. The radishes are long gone and the mustard and arugula are just now going to seed, but the lettuces have a little more time left in them. The bed is packed so full of garden plants that hardly a weed peeks through anywhere. Many years ago, at this time of the year, I was hiking in Minnewaska State Park when a most delectable, spicy-sweet aroma wafted past my nose. I followed my nose off the trail and into the woods. After stepping over and around fallen stumps in boggy soil and ducking under low-hanging branches, I came upon the source of that aroma: the white flowers of a large swamp azalea (Rhododendron viscosum). Last night as I lay in the comfort of my my bed and was about to drift off to sleep, that very same scent drifted into the open bedroom window. I immediately knew the source of that aroma: a swamp azalea that I had planted in a bed along the north side of my home back in 2006. The hardest part has been getting the caterpillar to smile. This caterpillar is about 20 feet long and 3 feet high, 5 feet to the top of its antennae, and it lives near a wall along the front of my house. It’s green. It’s a yew. The caterpillar started out conventionally enough. 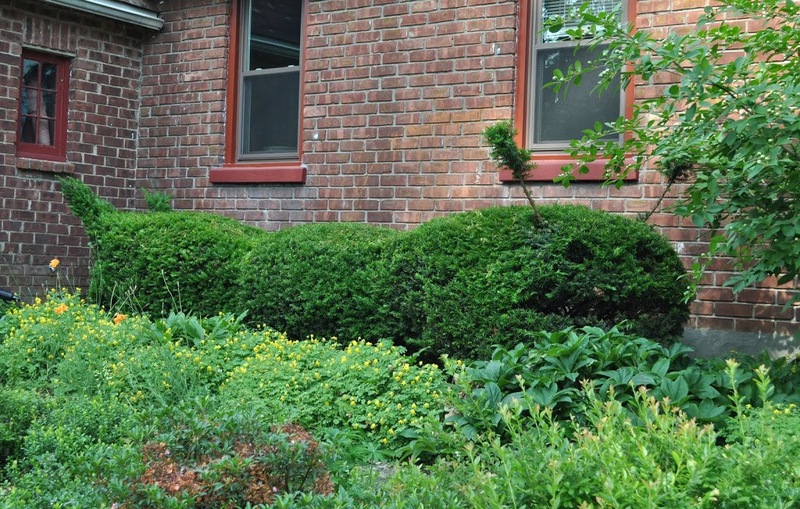 Like so many gardeners and new homeowners, I succumbed to the enticement of inexpensive evergreens – in this case, 5 innocent-looking, small yew bushes – to dress up the bare front of my house. Once planted, they would contribute to the ubiquitous gumdrop school of landscape design. That was over 25 years ago.